Maery from Montreal made this amazing pivot hat. I'm in love with the colors. (see, my purple obsession is rearing it's head again)! She used Lana Grossa Royal Tweed. I had to add that because if you're like me, you're staring at that yarn and going, "WANT", while helplessly scratching at the screen trying to touch it. I am on the yarn diet. Not allowed to purchase more. I am however, allowed to swap. 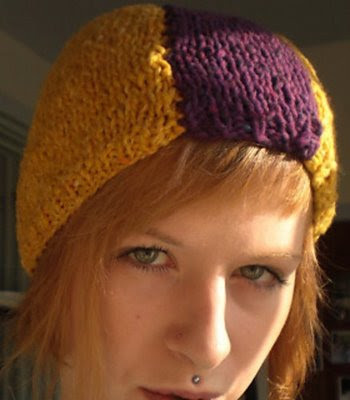 So I might just have to take to the ravelry forums and try and snag some!